Jean-Sébastien Besner and Marc-André Lamontagne Win the Lanark Highlands Forest Rally ! May 6, 2018.- After a three-month hiatus, this weekend, the Eastern Canadian Rally Championship (ECRC) presented the second of eight rounds that make up the 2018 season. 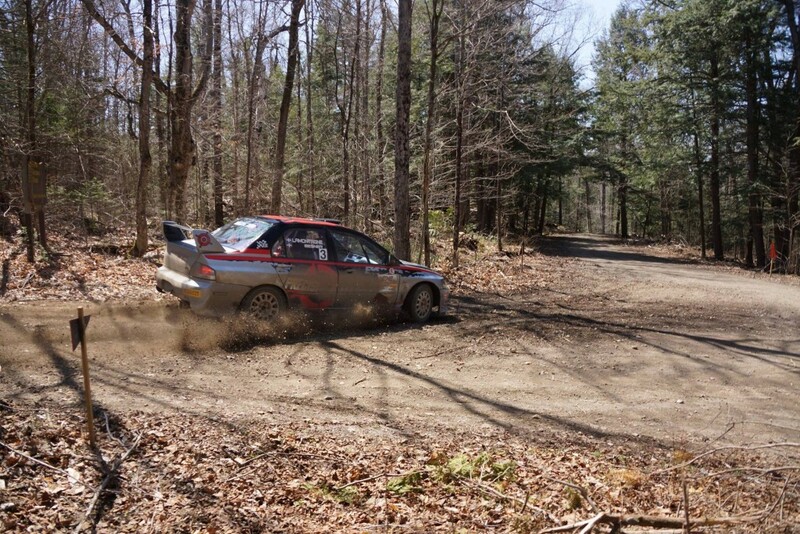 On magnificent forest roads southwest of Ottawa, Quebeckers Jean-Sébastien Besner and Marc-André Lamontagne drove their Mitsubishi Lancer Evo to victory at the Lanark Highlands Forest Rally. The thirteen teams entered in this springtime event saw Quebec competitors monopolize the overall podium. Joining the Besner/Lamontagne duo on the highest step were Marc Bourassa, co-driven by Élise Racette in second place with their Subaru WRX STI, followed by Philippe Benoît/Jonathan Desgroseillers, who were also the event’s two-wheel drive winners. For Bourassa/Racette, the eventual gap behind Besner/Lamontagne was 44.7 seconds, which included a 20 second penalty Bourassa/Racette received for checking in late into the first time control. Despite this penalty, the battle for first place remained tight throughout the event’s ten competitive stages. As for Benoît/Desgroseillers, their exceptional performance resulted in a lead of more than six minutes over their closest two-wheel drive rivals. The Eastern Canadian Rally Championship (ECRC) is comprised of eight rounds this season, spread out between Ontario, Quebec, and the Maritimes. The Black Bear Rally, next event in the calendar, will take place again in Ontario, on June 23rd, in Gilmour.